The richly imagined world of MONSTRESS is an alternate matriarchal 1900s Asia, with an art deco-infused steampunk aesthetic that's brimming with arcane dangers. Within it, a teenage girl struggles to overcome the trauma of war, a task that's made all the more difficult by her mysterious psychic link to an eldritch monster of tremendous power--a connection that will transform them both, and place them in the crosshairs of both human and otherworldly powers. 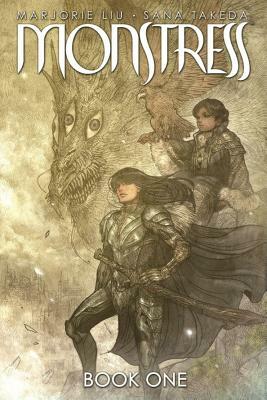 Creator/writer Marjorie Liu (who made history as the first woman to win an Eisner Award for Best Writer) and creator/artist Sana Takeda present a deluxe, oversized hardcover edition of their beloved breakout comic in MONSTRESS BOOK ONE. Collecting the first 18 issues of the New York Times bestselling series, this massive edition features a striking new cover, as well as special extras, including never-before-seen sketches, script pages, and more for over 500 pages of award-winning content.